This site's Trainweb.org host allows inclusion of a small per cent of non-railroad content, so I will use that opportunity to illustrate unusual traffic intersections in Baltimore city. 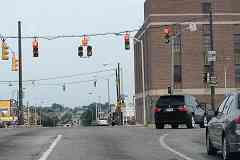 During my trips over the years exploring the B&O nowhere have I encountered as many unusual and confusing automobile intersections as within the city. 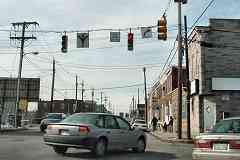 Baltimore city's signage and traffic signals employ a style not replicated in the surrounding counties. The local drivers who frequent these intersections have by sheer repetition no doubt learned the proper interpretation, but a visitor has little similar experience by which to decipher ambiguous elements. 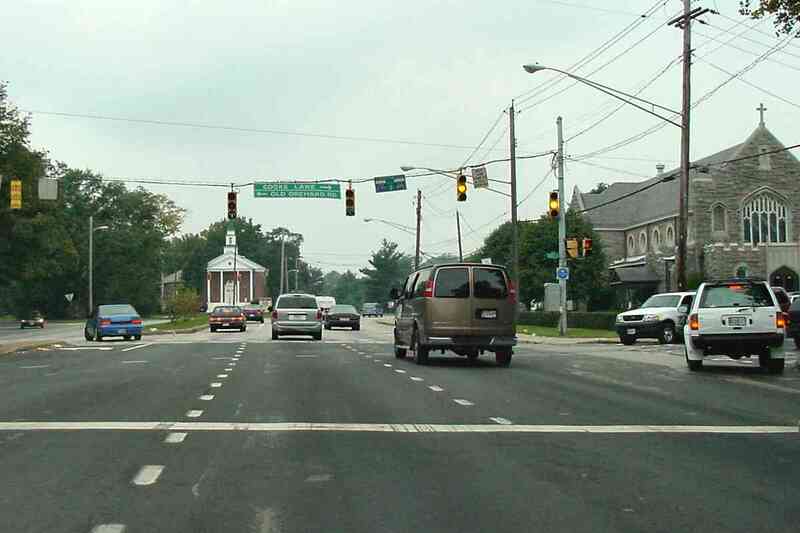 In general, confusion at an intersection, even momentary, is Not A Good Thing. 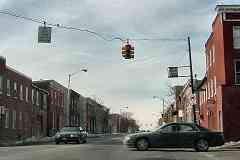 People ask, "Does Baltimore really look like it does in The Wire?" As in any city, Baltimore has sections that are old, new, in disrepair, or regentrifying... cities evolve. For dramatic effect a show like The Wire highlights the extremes. 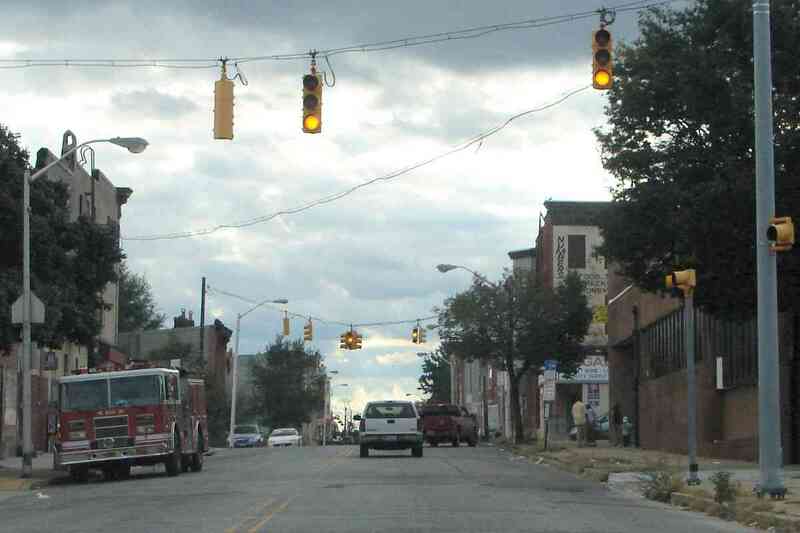 So, yes, The Wire's street scenes exist in Baltimore, but they are not average, typical or widespread. The pictures below illustrate what is far more common. For anyone who wants to learn why big cities like Baltimore have the problems they do, as well as possible solutions, The Wire will be edifying. 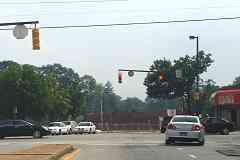 The sign proclaims "No Turn On Red"... well, we have four red signals, and three green arrows simultaneously eastbound at Edmondson Avenue (US 40) near Poplar Grove Street. The local drivers are turning right so perhaps the sign should read "Turn On Green Only". White pavement arrows in each lane would help too. Westbound on Lombard Street at Kresson Street... another No Turn On Red sign, this time combined with red signal, green signal, and green arrow. 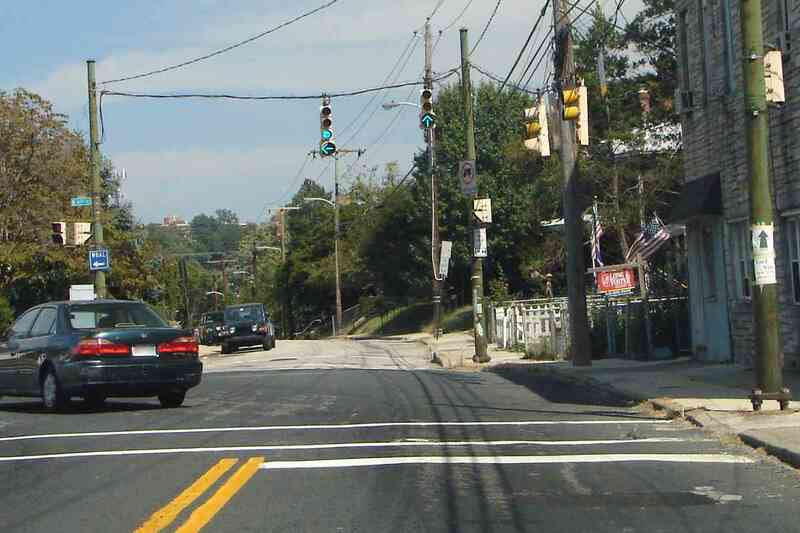 I suppose the two signal heads are an attempt at individual lane control, but in general when a lane is turn only (as is the right lane), its traffic signal does not display red while turning is allowed. Side note: the circular O in "Only" is the hallmark of some of the oldest Baltmore signage, likely dating to the 1950s. 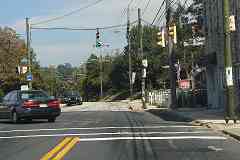 Newer "Only" signs employ a font with a more oval letter O, similar to the O in the "No Turn On Red" sign at left. 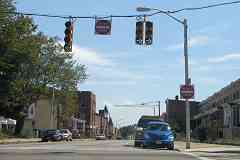 Two generations of No Left turn signs grace Orleans Street west at Patterson Park Avenue. 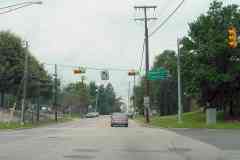 The rectangular bracket holding the older No Left sign on the right can be found at many intersections, but only a few retain their original signs. Putting the newer No Left above the left lane was a welcome improvement. 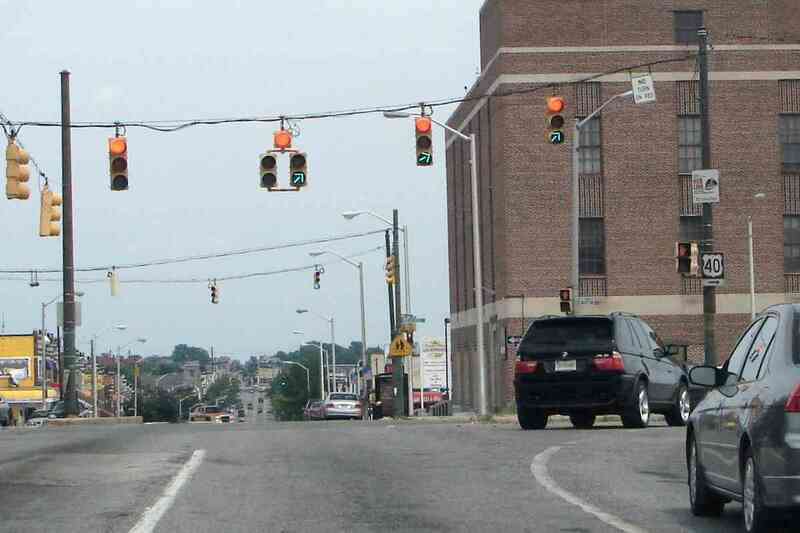 Also of note is the Eagle brand traffic signal, this one with a mismatched set of visors. In the past the Eagle, notable for its "traditional" four-way traffic signal shape, had been common in Baltimore, but only a handful survive on duty. Four lanes, four signals, two in the process of changing, two staying green. I cannot think of a good reason the two right lanes should be stopped while the two lanes heading straight are allowed to proceed. An odd collection of signal equipment hangs over Druid Park Drive at 41st Street including oversize arrows, and mismatched (or missing) visors. Most eastbound traffic turns left onto 41st Street, and no road intersects from the right. Hmm, a Stop sign mounted on a traffic signal pole... "Yes, driver, this means you really, really need to stop at this red signal!" "Driver, stop even if the signal is green." "Stop underneath the signal?" Your guess is as good as mine. 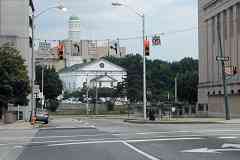 Gwynn Oak Avenue crossing Liberty Heights Avenue. "The stop sign is only supposed to be deployed if the signals go dark. It should be folded up or covered otherwise. This appears to be an error on the part of Baltimore, though I would have to see it in person to be certain of what's going on. (Usually it's done manually by the local police agency. At least one idea I've heard of has the signs locked up by a magnet. When the power goes out, the magnet fails, and the top of the sign drops down. But then when the power comes back on, I don't know how the sign folds back up...)"
What is amber doing on the bottom? The parked firetruck gives away the answer. 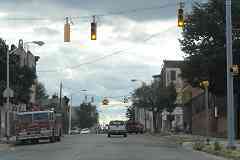 Westbound on Lafayette Avenue, the more typical amber is ahead at Gilmor Street. 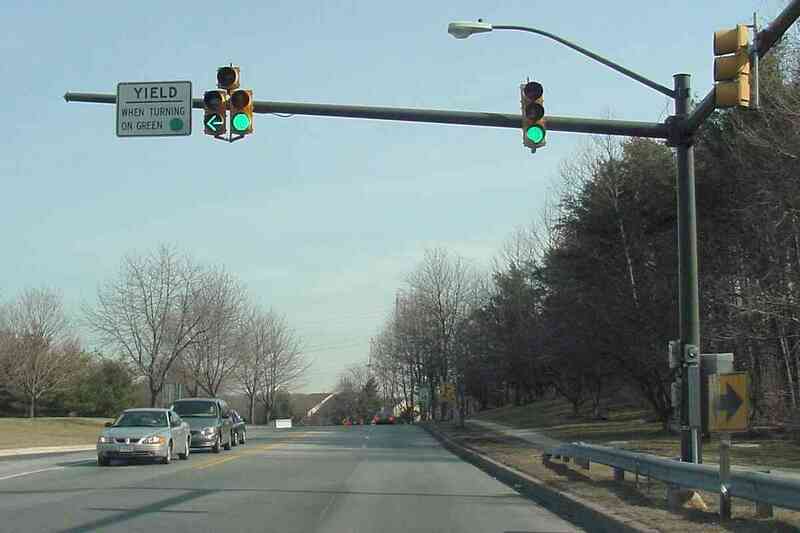 For better visibility beyond an I-695 bridge, signals at the intersection of Dogwood and Ambassador Roads are mounted horizontally. Horizontal mounting is common in some parts of the country, but not around Maryland. Know of another near Baltimore? Send me a pic. Where two lanes of St. 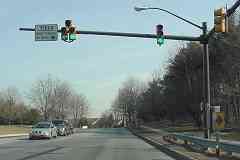 Lo Drive exit Clifton Park, they meet northbound Washington Street head on. Why two right arrows? 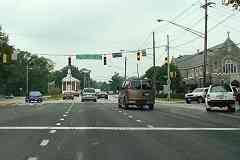 Do two rights make it wrong to turn right from the left lane? Answer: it's for philosophers to debate. What does this red signal mean? Don't drive straight into the keep right sign? Stop before turning left? Beats me. Does this red signal at Wilkens Avenue ever go unlit? Since the signs describe the hours during which left turn on red is not permitted, that implies during other hours left on red is allowed. 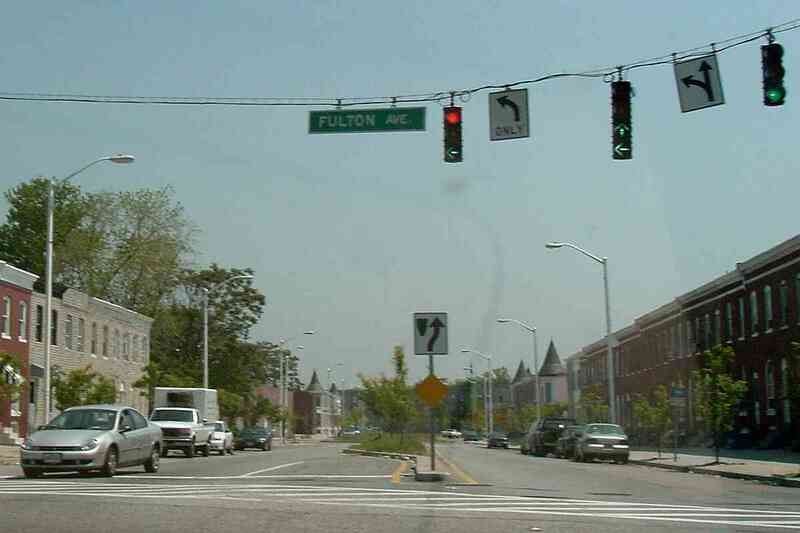 "Right on red" is commonplace, but "left on red" intersections such as this one where Lexington Street meets Gay Street are rare. 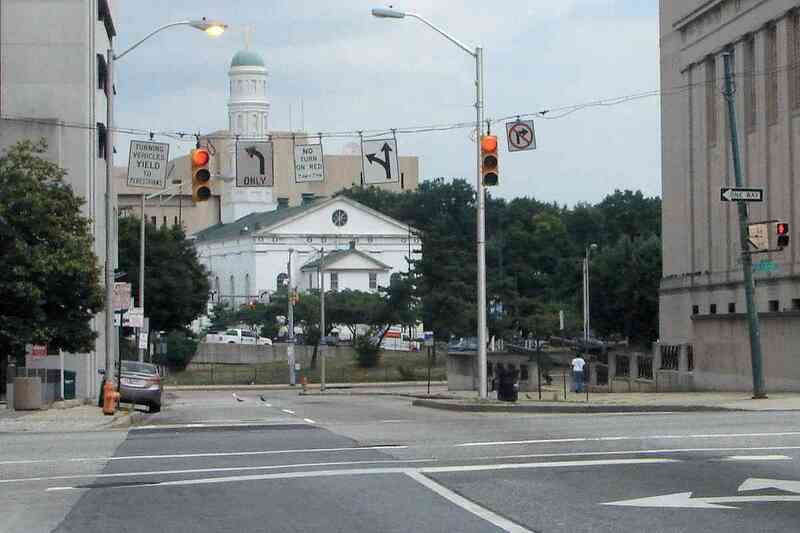 On the right is Baltimore City Hall; the white building in the distance is St. Vincent de Paul Church. In my opinion, this is a better signal sign for intersections with turn lanes. 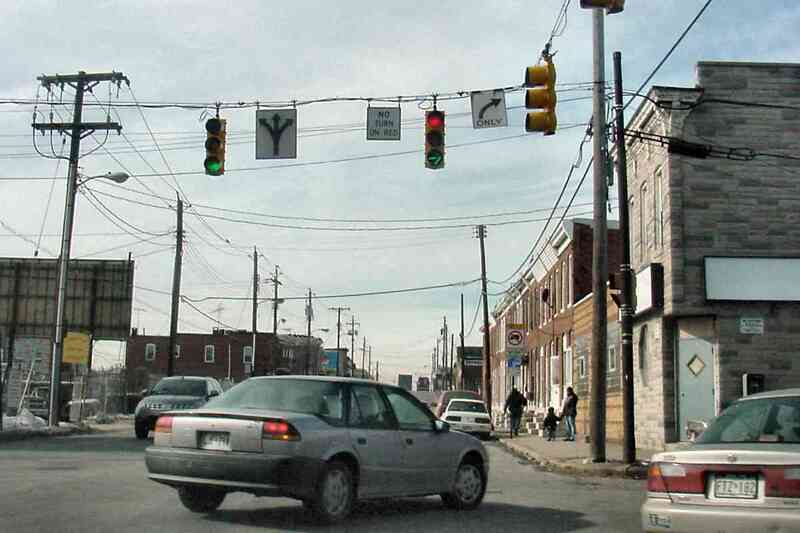 The dual amber/green signal more clearly represents when turns are permitted, and avoids the confusing combinations of arrows and full circles lit simultaneously. 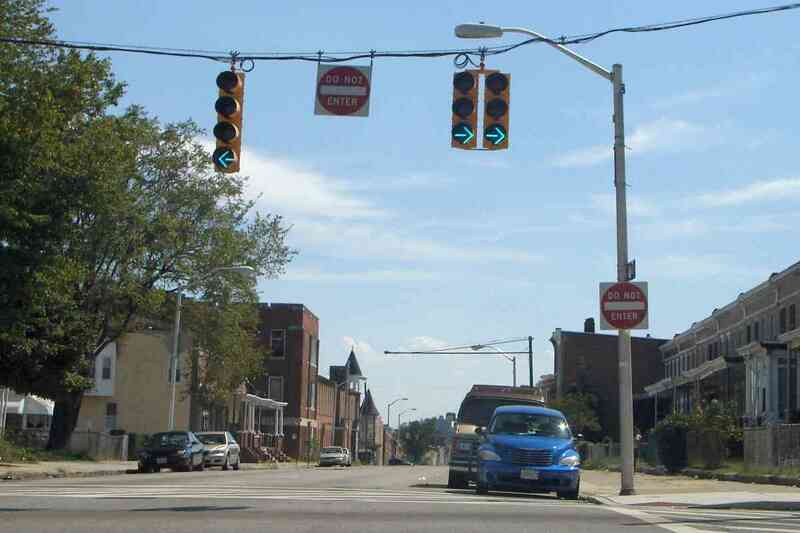 This configuration is common outside Baltimore city... that it has begun appearing within the city too, suggests Baltimore is gradually upgrading to this design. 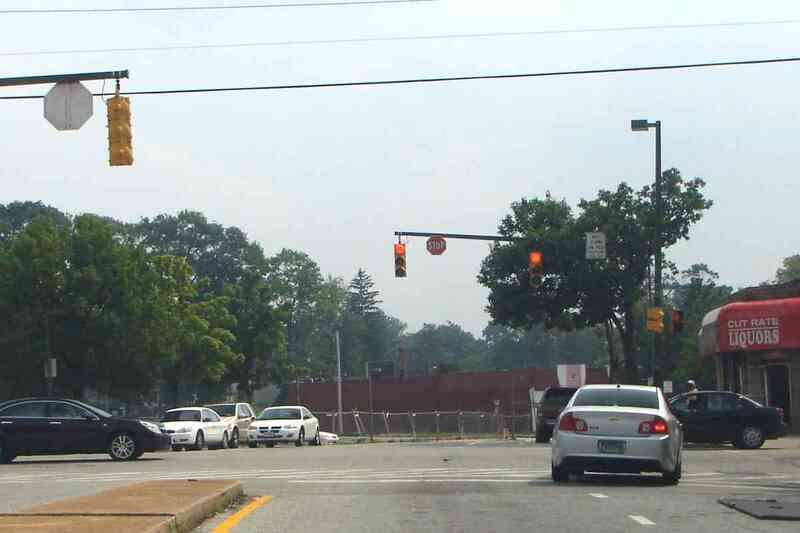 Know another confusing Baltimore intersection? Send me a picture.